This strip might seem familiar to a few, it actually first ran in my college newspaper about a year ago. I’m just now getting around to collecting all those strips (the good ones at least) and putting them online here for people to see. It also helps when I don’t have any new art or comics to show. Cat scientists will always have a special place in my heart. I’m working on a big article for friday, so be sure to check by then, but for now make sure you LISTEN TO EPISODE 3 OF THE NIGHTMARE SHARK PODCAST! If you like it, go check out the other episodes as well. We’re trying to put out one a week. I feel like this may have also been a farside comic once upon a time. Or something like it… But I did in fact giggle when I saw this. It’s in the same Larson-esque vein of humor. I guess I’m flattered by the comparison! Thanks! I DO MY VERY BEST! 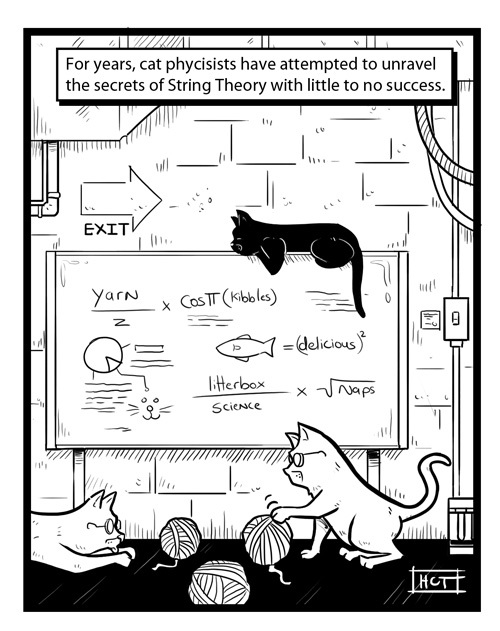 Shrodinger’s Cat figured out String Theory, actually, but when Shrodinger checked on him he was already dead, and the secret died with him. omg shut up you’re so rude!